This is something new: Never before has a Brazilian president so demonstratively acknowledged US supremacy. Not only in Latin America, but also on the world stage. Even during the Cold War, Brazil's military dictatorship of the time kept a greater distance from Washington than President Jair Bolsonaro intends to. His foreign minister regards US President Donald Trump as the "savior of the West." 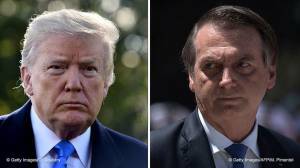 The outcome of the meeting will depend on the chemistry between Trump and Bolsonaro: Two impulsive, choleric politicians who pay little attention to their advisors, and rarely act with long-term strategies in mind. Trump and Bolsonaro, dubbed the "Trump of the tropics" by international media, are similar in their politics. Both of them skillfully feed the expectations of their followers via social media. For these two political outsiders, their online presences contributed decisively to their respective election wins. They were both shock victories — they even surprised themselves. The transition of power of their respective governments was correspondingly chaotic. Both of them have tense relations with their parliaments and judiciaries. They both consider the separation of powers to be obstructive and superfluous. Their followers herald them as saviors who rule "for the people" — unlike the out-of-touch political establishment before them. They deliberately use anti-democratic, misogynistic, violence-glorifying slogans that belittle minorities. But this is also a strategy to generate permanent public attention, dominate the media and to keep their fans captivated. Both paint nostalgic notions of the past when everything was "better." They support the weapons lobbies in their countries. They are anti-globalists. They do not hide the fact that they regard climate change as a myth and international organizations as nuisances. A hatred of traditional, mainstream media unites them. Trump presents himself as a successful entrepreneur and multi-billionaire — even if he uses all possible means to keep the public in the dark about his exact financial circumstances. He is well-connected, was already established in elite circles, and, for many years, a television celebrity. For Trump, "dealmaking" is at the center of everything he does. Personal gain — or "America First" now — is all that matters. Bolsonaro is, by comparison, a relatively unsuccessful former soldier. As a captain, he spent 15 days in a detention cell before switching to the reserves. He then spent six legislative periods in parliament as a backbencher, where he distinguished himself as a lobbyist for the retired military without gaining much influence in politics. He was neither privileged nor well connected, apart from within the military and the Rio de Janeiro militias. He is far from worldly or cosmopolitan. However, unlike Trump, he makes no secret of the fact that he has no answers to many questions. While Bolsonaro is open with his admiration for Trump, the feelings do not seem to be entirely reciprocal. For Trump, the unexpected ally in South America is a gift for which he has hardly had to show his gratitude so far. Things might change now. The admiration aside, Bolsonaro has clear domestic policy goals in mind. By visiting the most powerful man in the free world, he wants to impress his voters back home. Evangelicals like the fact that Bolsonaro is meeting with fellow believers. Brazilian business leaders and investors, who are backing Bolsonaro, hope that Trump will approve Brazil's entry into the OECD, the club of industrialized countries — until now the US has been reluctant to support admission for the country. And members of the military, who dominate Bolsonaro's cabinet, want to see Brazil become a close ally of the US outside NATO, a so-called Major Non-Nato-Ally. That would improve access to US military equipment. Joint operation of the missile base in Alcantara, a small Brazilian town on the equator, would also be attractive for the military. Brazil's wish list is long, while that of the US is short. But it does contain one item in particular: Venezuela. For Trump, an end to the dictatorship in the Caribbean is vital for the US elections in 2020. On that front, he needs every kind of logistical, even military, support that Brazil can provide. At first glance, there is every reason to believe that the two presidents will usher in a new era of US-Brazil relations. But how long such a friendship would last, and what this means for other regions of the world such as Europe or China, is more difficult to predict.